Rodric Braithwaite, British ambassador in Moscow from 1988 to 1992 and author of "Afgantsy" reviews Serhii Plokhy's "The Last Empire", recounting the final days of the Soviet Union. For those of us who were there at the time, it is sometimes disconcerting to follow the rise and fall of new interpretations and old myths about the collapse of the Soviet Union more than two decades ago. The instant histories and the memoirs have all been written. It is now the turn of professional historians to rummage in archives and benefit from the perspective of time. Their interpretations differ, of course: after all, we are still arguing about the reasons for the collapse of the Roman Empire. Within weeks of the collapse, President George H W Bush claimed victory for America, a triumphalist and highly partial assertion, uncharacteristic for such a normally cautious man. 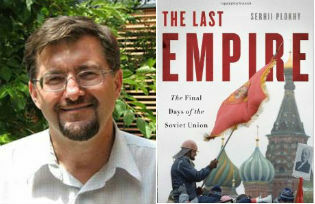 Serhii Plokhy, a distinguished Ukrainian American scholar, sets out to refute it in The Last Empire: The Final Days of the Soviet Union, his substantial new book about the last months of the Soviet Union; not least because he believes that it underlies later misjudgements in America’s dealings with the rest of the world. For the Soviet collapse, as Plokhy rightly argues, came about as a result of a variety of factors of which American action, though important, was only one. In the end, the Soviet system was brought down by its own internal weaknesses and contradictions, and by an accumulation of problems, which its rulers recognised but were unable to resolve. Individuals mattered too: the cautious Bush, the rumbustious Russian leader, Boris Yeltsin, the wily Leonid Kravchuk from Kyiv. But the one to single out, Plokhy suggests, is Gorbachev, ‘a tragic figure … a visionary and a man of great achievement,’ without whom the collapse might have been a lot more bloody. Even the Russians, who now despise him as a traitor, can be grateful for that; and for the end of the nuclear confrontation that went with it. Among the factors, which destroyed the Soviet Union, of which Gorbachev eventually became painfully aware, Plokhy places much emphasis on the complexity of the relationships between its constituent parts. How were the constituent republics of the Soviet Union to be kept together once the instruments of empire no longer functioned? The trouble was that there was no solution beyond the widespread use of force, which in the end Gorbachev refused to contemplate. Plokhy reminds us that Gorbachev was not alone in hoping that the Union could be preserved: he was supported at first by his arch-rival Yeltsin, and by George Bush, fearful of what would happen to the Soviet Union’s nuclear weapons if the place disintegrated, whose disastrous ‘Chicken Kyiv’ speech calling on the Ukrainians to remain in the Union won him no plaudits among them. In what is essentially an account of the way an empire was destroyed by conflicting nationalisms, Plokhy gives due credit to the Balts, who took the lead. He recognises the importance of the incoming tide of Russian nationalism, so ably exploited by Yeltsin. But the driving force, he maintains, was Ukraine, especially in the six months before the Soviet Union fell apart. He is of course right that the Union could have survived the departure of the Balts, but would have made no political sense without Ukraine, its second largest component. In its last months the intransigent Ukrainians dealt the Union one hammer blow after another: they shilly-shallied over Gorbachev’s gallant but doomed attempt to negotiate a looser, more confederal Union in the Summer and Autumn of 1991; immediately after the attempted right-wing coup in August they declared independence and uncompromisingly rejected Yeltsin’s ill-judged attempt to negotiate a change to their borders and to the status of Crimea; and they resisted proposals for an orderly solution to the problem of Soviet debt, in November. A crucial referendum in early December saw the Ukrainians –despite their ethnic divisions – vote massively to confirm their independence. A few days later they accepted Yeltsin’s scheme for an insubstantial Confederation of Independent States, which drove a stake through the heart of the dying Union. But their heart was not in that either, and it was largely because of them that Yeltsin never got the Russian-dominated body for which he had hoped. But the final six months, to which Plokhy devotes most attention, were no more than the last act of a protracted, multifaceted, and epic drama. By then it was no longer a question of whether, but of how, the Soviet Union would finally fall apart. Ukraine’s crucial involvement had begun some time earlier. For years it had remained, through successive waves of repression, and only in appearance, one of the best disciplined of all the Soviet republics. Shcherbitsky, its conservative Party leader, resisted Gorbachev’s unsettling reforms. But after Gorbachev sacked him in 1989, Ukraine began to move – demonstrations began in Kyiv that Spring. By Autumn, it was already clear that we were witnessing the break up of the last European empire; and that Ukraine was key to what would happen next. Leaders of the Ukrainian opposition party Rukh emerged to talk freely to foreigners, including British ministers. By June 1990, thousands of demonstrators were flying the blue and yellow flag of an independent Ukraine over what is now Kyiv’s Independence Square, the site of the Orange Revolution in 2005 and Euromaidan in 2013. Watching them, my KGB driver, a shrewd, extravagant and ultimately tragic observer, remarked that it was not yet a full rebellion: the demonstrators were just getting into practice. By August 1990, Rukh was politically dominant in Lviv in Western Ukraine, where the embattled local Communists already had their backs to the wall. Throughout, one could watch with fascination as loyal Soviet bureaucrats – Kravchuk, an ambiguous hero in Plokhy’s narrative, Zlenko, the smooth Foreign Minister, Yelchenko, the ponderous Secretary for Ideology –changed before one’s eyes into Ukrainian patriots. Some started for the first time to speak Ukrainian on public occasions, not always with notable success. Plokhy fixes on one detail, which graphically illustrates the confusion colouring the emotions of Russians and Ukrainians as they think about the tortured history that both binds and divides them. In 1972 President Nixon visited Ukraine. Thinking to pay the Ukrainians a compliment, he described Kyiv as the mother of all Russian cities. For Russians, that was no more than a glimpse of the blindingly obvious. They believe, with justification, that their civilisation, their language, their religion, and their culture first came from mediaeval Kyiv, in the days when many of the princelings who ruled in and around Moscow were directly related to the Kyivan ruling family. But when Kyiv was destroyed by the Tatars in 1240 the lands that became Russia and Ukraine started a very separate development. For modern Ukrainians, therefore, Nixon’s remark was close to an insult implying that Kyiv itself is no more than another Russian city, and that by extension Ukraine is no more than another part of Russia. It is an implication that they deeply resent. All that is to project today’s political passions back a thousand years. But it is the stuff of which political myths and political emotions are made; and it all helps to confuse thinking in Moscow, Kyiv, and the capitals of the West as they grapple with the current crisis between Russia and Ukraine.